The practice of head hunting - removing the head of an adversary after killing him in battle as a trophy of the victory - is historically widespread over much of the world. In the 3rd century B.C. Chinese state of Qin, soldiers would collect the heads of their fallen enemies and tie them around their waist to terrorize and demoralize their opponents during battle. In New Guinea, the Marind-anim tribe would take the head of their enemies to control their spirits and would often also cannibalize the flesh of their bodies. The Celts of Europe also practiced headhunting up through the end of the Middle Ages. A successful Celt warrior would nail the heads of his enemies to his walls as a warning to others. Despite the many forms of head hunting around the world, only one group traditionally practiced the art of taking a trophy human head and reducing it in size to that of a man's fist. Head shrinking, as this practice has come to be known, was the exclusive providence of the Jivaro Indians who live in Ecuador and the nearby Peruvian Amazon. The Jivaro are divided into smaller sub-groups which include the Shuar, Achuar, Huambisa and the Aguaruna tribes. When the Spanish conquered much of South America starting in the 16th century, they found the Jivaro a difficult problem. They were fierce warriors who were not easily subjugated. According to records, in the year 1599 the tribes of the Jivaro united in a revolt against the Spanish. Apparently 25,000 colonists were killed during the attacks. During the uprising the Jivaro raided the town of Logrono and took out their anger over a tax on the gold trade by seizing the governor and pouring molten gold down his throat. After this rebellion the Jivaro territory, despite its value as a gold-producing region, was never again under Spanish control. This makes the Jivaro the only native group to lead a successful uprising against their Spanish masters. Their backlash against the conquistadors was so violent that the word Jivaro soon entered the Spanish language with the meaning "savage." Because of outsider's fear of the Jivaro and the remoteness of their dense, jungle territory, little was known of them until the 20th century. What stories did come out, however, were very frightening. Despite their success on one occasion against the Spanish, the Jivaro people never really united as a political unit. Even though their customs, appearance, beliefs and culture were very similar, they lived in small individual communities. These groups were constantly at war with one another. While around most of the world war is about gaining and controlling territory, war for the Jivaro was about vengeance. Each killing required retribution in a practice known as blood revenge. The Jivaro feared that if they did not avenge the death of a relative, then the spirit of that relative would be displeased and cause all manner of bad luck for the tribe. In fact, the Jivaro feared their own ancestors more than the spirits of those whom they killed in their clashes. During the raid of another village a warrior always took care to retrieve the head of his victim by decapitating it, passing a head band, or vine up through the throat, out the mouth and then slinging it over his shoulder, allowing him to make a rapid retreat. A raid might be considered a disappointment even if several enemies were killed if no heads were recovered. The practice of taking heads was common over much of the world but the Jivaro added an extra step to the practice through a process that creates what the Shuar tribe calls a tsantsa. To start the tsantsa process, the flesh is first peeled away from the skull by making an incision up the back of the neck. The skull itself and its contents are discarded into a nearby river. The warrior then sews the eyes closed and the mouth is sealed by the use of small, sharp palm pegs through the lips. At this point the skin is put into a boiling pot and allowed to simmer for between an hour and a half and two hours. The solution in the pot includes a number of herbs containing tannin, a compound that will preserve the skin. The length of time in the pot is critical as too short a time will result in the head will not shrinking properly and the flesh on the inside of the skin not loosening. Too long in the pot and the hair on top of the head will fall out. When the head is taken out of the pot it will have shrunk to about one-third of its original size and have a rubbery texture. The skin is turned inside out and any flesh still adhering to the inside of the skin is scraped away. The incision at the back of the neck is then crudely sewn back up and the skin turned right-side out. The next step is the drying process. The head will continue to shrink during this stage as it is turned upside down and filled with small rocks heated by a fire. When the head gets too small for the pebbles, hot sand, heated in a bowl, is used. Hot rocks are also applied to the outside of the head to help shape and maintain the features. It is important to the Jivaro warrior to make sure that the final product resembles the original victim. 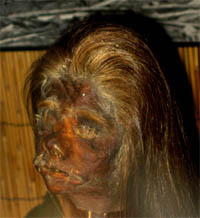 Even so, the faces on shrunken heads usually have some distortion because the area of the lower face shrinks less than the skin on the sides of the forehead, causing the jaws to appear to jut outwards. The use of hot rocks and sand to shrink and shape the head lasts several days. After that the next steps are to remove the pegs through the lips and replace them with dangling cotton cords, rub ash into the skin, and finally hang the head over a fire to dry and harden. When this is done the head can then be attached to a cord through the scalp so that it can be worn about the warrior's neck. The whole procedure takes about a week and results in a miniature of the original head with a much darker skin tone. At the end of this process the warriors would hold the first of several tsantsa celebrations to commemorate the successful revenge on the enemy. In addition to a spirit that survives death, the wakani, the Jivaro believe that each warrior has magical personal power called the arutam. A warrior can increase his arutam by collecting heads in battle. In turn, should his head be taken, the warrior who collects his head will benefit from the original warrior's arutam. There is also a vengeful spirit of the dead warrior, the muisak, that is thought to be dangerous to the head's new owner and the shrinking process is considered a way of restaining or destroying the muisak. The eyes and mouth of the tsantsa are sewn shut in an attempt to contain this spirit within the head and keep it from escaping. Occasionally a head cannot be taken during battle. Either the warriors are forced to retreat too quickly or the victim is found to be a relative of the executioner (then taking the head is considered immoral). In these cirmcumstances a substitute tsantsa can be made from a sloth head. (The Jivaro believe that men are descended from animals, particularly sloths). 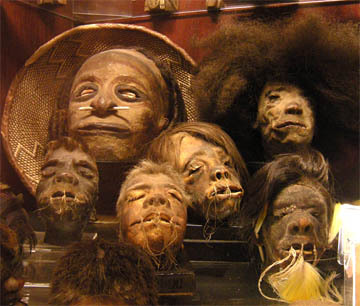 In the late 19th century Europeans and Americans, hearing stories about the Jivaro and their unusual traditions, started buying shrunken heads as curiosities. The going rate by the1930's was about $25 per head. The tribesmen soon learned that they could obtain money or a firearm in trade for a tsantsa. The use of guns led to an increased number of more deadly feuds, which in turn created more heads for the trade. 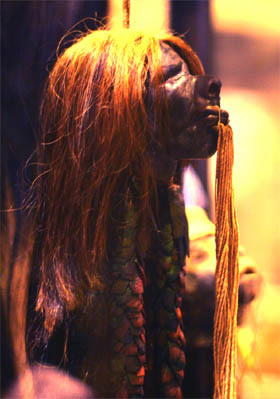 Because the demand for shrunken heads by tourists was actually causing the Jivaros to do more headhunting, the governments of Peru and Equator enacted strict laws forbidding the buying and selling of tsantsa in order to slow the slaughter. In the 1940's the United States also banned the import of shrunken heads. 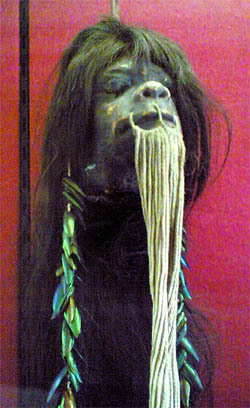 With the demand for souvenir shrunken heads high and the supply restricted by law, a counterfeit market soon developed. Some were produced by using goat, sloth or monkey skin fashioned into the shape of a human head. Experts trying to determine if a head is a fake will look at the shape and detail of the ears which are hard to duplicate. During the early 20th century some counterfeit shrunken heads were produced not by the Jivaro, but thousands of miles away in Panama. These fakes often involved real human heads taken from unclaimed corpses obtained at hospitals or morgues. To tell these heads from authentic tsantsa experts look for signs that the work was done by someone other than a Jivaro. The Jivaro used heavy cotton string to sew the mouth and back of the neck closed, not thin thread. On a true Jivaro shunken head the lips also bear the marks of the wooden pins used to seal the mouth during the preparation process. In general, the work on a tsantsa appears much neater and cleaner when the work is done by forgers, as the Jivaro did not have access to modern tools and equipment. Even with careful examination, however, connoisseurs have been fooled by clever fakes. 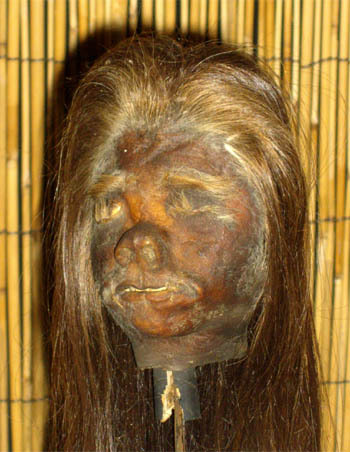 Some experts estimate that most of the shrunken heads held in many museums today are not real, but forgeries. Today, replicas of tsantas (usually made from animal products) are still sold, but are clearly labeled as fakes. Fortunately, the Jivaro tradition of making tsantsas from real human heads is, hopefully, completely gone now. As the 20th century wore on, missionaries penetrated the Jivaro territory, Christianized them, and their extremely murderous ways eventually departed. Now, though occasionally some sloth heads are prepared in the tsantsa fashion, the warring to obtain trophy heads is only part of a macabre history.